Our Summer programs are developed to encourage underrepresented minority students to pursue higher education, as well as, to give them the opportunity to experience the UW. Because we are no longer providing overnight lodging for Shades of Purple, we have decided to bring it near you! We will host the conference in various locations across Washington. 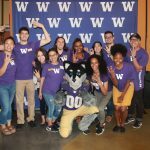 Shades of Purple in the Community will be a conference where students will learn more about the University of Washington.